Now for an unlikely hero that's been around for ages. Introducing Guybrush Threepwood (mighty pirate). A kid who starts off wanting to be a pirate, and still never quite instills fear into the heart of his enemies. 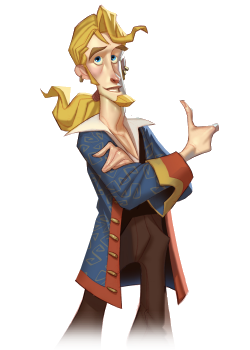 The reason Guybrush is a hero to me is that he's the nerd's hero. He often acts as a foil to the other randomness occurring in the Carribean and pointing out the folly in many typical pirate customs. Also throughout all the shenanigans he goes through, he always manages to find a way to defeat the evil zombie pirate LeChuck and stay loyal to his sweetheart, Elaine (even if he seems to ruin her plans and almost kill her). This places him at #4 in my PC Gaming Heroes list.